As you’ve probably seen on the news, Greece is in the midst of a debt crisis. While they seem to have salvaged some kind of deal that limits their chances of bankruptcy, what does this mean for the millions of travelers who have booked their trip to this scenic and historic region? If you’ve booked your trip to Greece far in advance, you may have not thought that a debt crisis would be at the center of your troubles. However, with closures and limits on funds, canceling your trip may be at the forefront of your mind. While details of the bailout are still being worked out, your money may go far. Traveling abroad to Europe with the family may bring history and adventure to life, but it can be costly if you don’t know where to cut down on travel expenses. If you’re venturing to Greece, places such as Santorini are ideal for watching the sunrise, relaxing on the beach, and sightseeing through the Acropolis. Unfortunately, the recent debt crisis has instilled fear in travelers who are preparing for their trip. There is also angst and strife over the debt crisis deal because it could contain pension reform and tax increases, but it shouldn’t keep visitors away from popular tourist attractions. Greeks were limited to monetary restrictions of approximately $60 per day. While this is a financial hardship to the civilians in the towns and cities, foreign tourists shouldn’t have too many complications when it comes to paying for items. ATMs are open and offer no monetary bank limits to outside tourists. This means that if you want to pay cash for dinner, trinkets, and activities, you’ll be able to obtain currency from the bank. However, if the ATM runs out of cash, you may have difficulties in obtaining the proper funds. You may also have to contend with long lines to get your cash. Greece has been in an economic crisis for quite some time. While the region has felt the pinch of the cash crunch, travelers have still made this scenic and breathtakingly beautiful region a must-see on their bucket list. From the beaches and historic sites to the food and people, Greece is a popular vacation destination. Life on the islands of Greece should be unaffected by the monetary strife. Most areas produce their own food and have a steady stream of tourist income. If you don’t want to cancel your trip, you should be prepared for your upcoming adventure. In addition to the right clothes, shoes, and personal belongings, you’ll also want to plan on how you’ll be paying for items. An assortment of options should include cash, credit cards, and debit cards. You should also have enough euros to cover unforeseen things such as food, lodging, and airfare. If ferry and other methods of transportation are reduced, you may find it more difficult to get around the more remote regions of Greece. Travel insurance is a necessity with the economic unrest in Greece. However, you probably won’t have to use it, especially if a deal is set in stone. A travel insurance provider will be able to let you know what is covered and not covered under your specific plan. The crisis in Greece probably also taught you to apply for a credit card if you don’t own one already. If you’re unable to obtain cash or you’ve run out of your allotted limit, you’ll still be able to pay for your hotel, meals, gas, and other activities while on your trip. However, credit card fees for overseas purchases can make a trip abroad even more costly. However, finding a card that offers no foreign fees allows you not to worry about the additional 2 or 3 percent that is tacked on to everything that you spend during your trip. While things should be somewhat normalized by the fall, there are still some major deals and decisions that need to be worked out. You also need to factor in that the media ups the volume of the news reported in Greece. You can do your part by learning firsthand about the situation in Greece. Enlist the help of tourist groups, fellow travelers, friends and colleagues overseas. 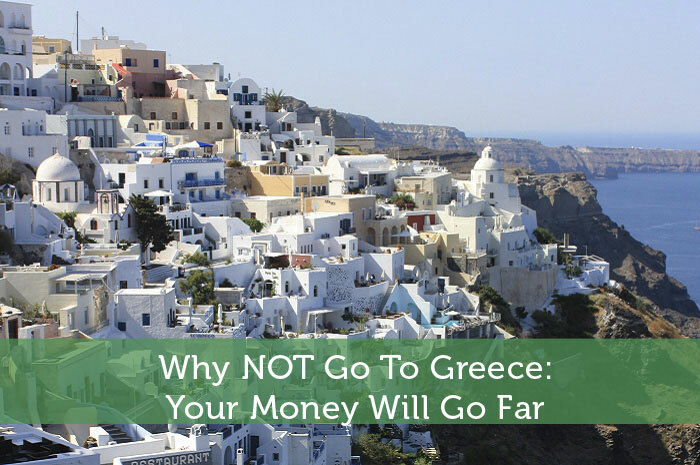 You can help Greece’s economy by not canceling your trip. Remember, the weather is absolutely stunning during the upcoming months. You may also not have to deal with an influx of other travelers to the region. In addition to the welcoming people, you’ll also find the prices significantly cheaper than usual, so it seems to be a win-win situation. Like you said, the key is to having sufficient funds. My only concern (and a mild one) would be that tourists may be at a higher risk for robbery. Or, at the very least, inflated rates so that places can get the cash THEY need. Greece is one of the best places I am planning to visit this year. And, there’s no way I am cancelling my trip. I am almost done with my itineraries and have informed my friends that we’re visiting the place. I agree with Abigail. Tourists right now might face greater risks and for this reason I would have to reconsider the trip. When I travel, I do so to relax. I don’t want to have to be on guard afraid that my belongings might get stolen or I could get swindled out of money. I’m planning to travel to Greece. Really wonderful country. I also wonder whether it’s good time to invest in real estate in Greece. I’ve heard the real estate is getting cheap and cheap due to financial crisis there. I wonder how much does a normal 2 bedroom house cost there? We are pretty close to Greece (on the map) and some of our friends went there, even during the crisis. They were pleased overall with their vacation. Yes, they were limited with their debit/credit card usage, but most of us actually travel with cash (bank fees here are outrageous when it comes to using cards in another country), so they were unaffected.